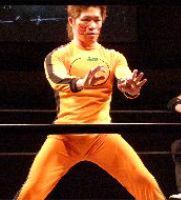 MIKAMI originally trained in the Michinoku Pro Dojo, but debuted in Pro Wrestling Crusaders in 1995. In 1997 MIKAMI followed Sanshiro Takagi to the newborn DDT, where he became one of the top wrestlers. In 2000 MIKAMI traveled to Puerto Rico, where he won the IWA World Junior Championship. MIKAMI has captured all the DDT titles during his career. 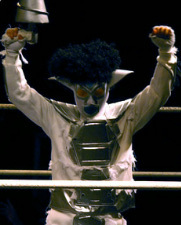 A wrestler characterized by an high-flying style, MIKAMI usually uses a ladder in his matches. In 2005 MIKAMI inaugurated his own DDT brand called Cruiser’s Games, running a couple of shows a year.